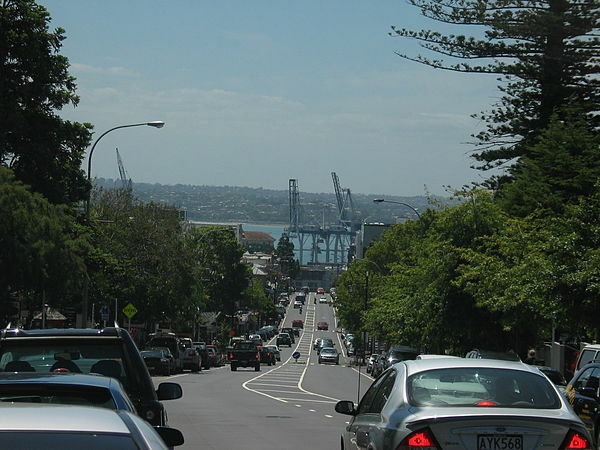 Parnell is an upmarket suburb in Auckland, New Zealand. It is one of New Zealand’s most affluent suburbs, consistently ranked within the top three wealthiest, and is often billed as Auckland’s “oldest suburb” since it dates from the earliest days of the European settlement of Auckland in 1841. It is characterised by its mix of tree lined streets with large estates; redeveloped industrial zones with Edwardian town houses and 1920s bay villas; and its hilly topography that allows for ever present views of the port, the Waitematā Harbour, Rangitoto Island and the Auckland Domain. To its west lies the Auckland Domain, to the south Newmarket, and to the north the Ports of Auckland. Parnell Rise and Parnell Road make up the main road through Parnell. Parnell Rise leads to the central business district to the west; Parnell Road runs from Parnell Rise uphill to the top of the suburb, and then bends almost 90 degrees and continues towards Newmarket in the south-east. Parnell Road ends at the intersection of George and Sarawia Streets, where it becomes Broadway. Early European settlers knew Parnell Road as “Manukau Road” until well after the formation of Khyber Pass Road in 1845. During the early 1970s the suburb became rather dilapidated. Les Harvey, a local businessman, bought up several properties cheaply and created “Parnell Village”, encouraging others to follow his lead. This revitalised the area as a week-end tourist shopping-destination. This involved Parnell re-inventing itself as a set of “Ye Olde Worlde Shoppes”. As many other Victorian buildings underwent demolition in Auckland at the time, period materials became available cheaply, and the buildings of Parnell village emerged altered, extended and tarted up in a somewhat fanciful but fun ersatz Victorian style. Much of this restyling remains in evidence within Parnell Village and around the Parnell Road shopping area, partly because of the ongoing ownership of the Harvey family’s company, City Construction. Along the upper part of Parnell Road stand a number of 19th century houses, most of them now used by law firms, accountancy firms, shops, and a few restaurants. The lower part of Parnell has a larger concentration of Edwardian retail buildings, including a number of fashionable boutiques, nightclubs and bars. The streets to each side of Parnell Road remain mainly residential in character, with some townhouses and apartments, especially towards St Georges Bay Road. At the bottom of Parnell Rise runs Beach Road, so called because it ran around the beach-front of the now-reclaimed Mechanics Bay and Official Bay. St Georges Bay disappeared at the same time. Here stands the former Auckland Railway Station, an impressive brick 1930 structure, designed by Gummer and Ford. The City Fathers relocated the Auckland train terminus here from the bottom of Queen Street in 1930 to become the centrepiece for the new downtown business area of Auckland. The plan did not prove successful; the station building ceased to operate as a station in 2003 when Britomart Transport Centre became the new Auckland terminus at the former Queen Street site.